We Love Cats. ~ We adore them. ~ We’re nuts about them. 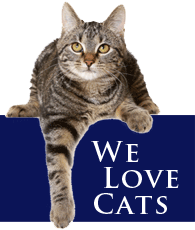 Yes, it makes us a tiny bit eccentric, but our passion pushes us to pursue the best options for the healthy life of your cat. Come in and meet Dr. Cynthia Rigoni and all of her staff. We want you to feel at home, informed, and as ease that you have found the right vet clinic for your feline friends. "I love this vet! She and her staff are very personable, and truly concerned with your cat/kitten health. I am so happy I was referred to this vet by a breeder. As a breeder, I know how difficult it is to find a truly good vet. I would recommend this vet to anyone with a cat, or breeding cats! A real winner!"